Jakarta (also Djakarta or DKI Jakarta), formerly known as Sunda Kelapa, Jayakarta and Batavia is the capital and largest city of Indonesia. Located on the northwest coast of the island of Java, it has an area of 661.52 km² and a population of 8,792,000 ( 2004). Jakarta has been developed for more than 490 years and currently is the ninth most densely populated city in the world with 44,283 people per sq mile. Its metropolitan area is called Jabotabek and contains more than 23 million people, and it comprises an even larger Jakarta- Bandung megalopolis. Jakarta is served by the Soekarno-Hatta International Airport. Since 2004, Jakarta, under the governance of Sutiyoso, has developed its new transportation system, which is known as " TransJakarta" or "Busway" and in 2007, Jakarta will establish its newest transportation system, the Jakarta Monorail. 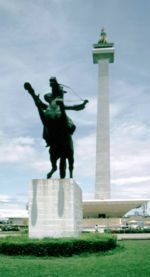 Jakarta also is the location of the Jakarta Stock Exchange and the National Monument. The first recorded statement of what is now Jakarta was the port of origin that can be traced to a Hindu settlement as early as the 4th century. By the 14th century, it had been a major port for the Hindu kingdom of Sunda. The first European fleet arrived in 1513, which were four Portuguese ships from Malacca. Malacca had been conquered by Alfonso d'Albuquerque in 1511, when the Portuguese were looking for spices and especially pepper. The relationship between the Kingdom of Sunda and Portugal intensified when another Portuguese named Enrique Leme, visited Sunda with the intention to give a present. He was well-welcomed in 1522, and because of that the Portuguese received the rights to build a warehouse and expand the fort in Kalapa (the name of the location). This was regarded by the Sundanese as a consolidation of their position against the raging Muslim troops from the rising power of the Sultanate of Demak in Central Java. In 1527, the Muslim troops coming from Cirebon and Demak under the leadership of Fatahillah attacked the Sunda Kingdom. The king was expecting the Portuguese to come and help them hold Fatahillah's army, as an agreement had been in place between Sunda and the Portuguese. However, Fatahillah's army succeeded and conquered the city on June 22, 1557, and Fatahillah deciced to change the name "Sunda Kelapa" into "Jayakarta" ("Great Deed" or "Complete Victory"). The followers of the Sultan of Banten (the location of Jayakarta), Prince Jayawikarta, was also majorly involved in the history of Jakarta. In 1596, many Dutch ships arrived in Jayakarta with the intention of trading spices, more or less the same as that of the Portuguese. In this case, the Prince took the Dutch arrival seriously as the Dutch had constructed many military buildings. Prince Jayawikarta apparently also had a connection with the English and allowed them to build houses directly across from the Dutch buildings in 1615. When relations between Prince Jayawikarta and the Dutch later deteriorated, his soldiers attacked the Dutch fortress which covered two main buildings, Nassau and Mauritus. With the help of 15 ships from the English, Prince Jayakarta's army was able to defeat the Dutch, which was under the governance of Jan Pieterszoon Coen (J.P. Coen) in 1618. From that time on, the Prince had a friendship agreement with the English. Things then changed for the Prince, when the Sultan of Banten sent his soldiers and summoned Prince Jayawikarta to establish a close relationship with the English without an approval of the Banten authorities. The relationships between both Prince Jayawikarta and the English with the Banten government then became worse and resulted in the Prince's decision to move to Tanara, a small place in Banten, until his death. This assisted the Dutch in their efforts to establish a close relationship with Banten. In addition, the Dutch also had hired many soldiers from Japan, Germany, Scotia, Denmark and Belgium. The Dutch were finally able to conquer the city with a calm approach and changed the name to "Batavia", which remained until 1942. Officially, Jakarta is not a city but a province with special status as the capital of Indonesia and is hence headed by a governor instead of a mayor. Jakarta, as a province, is divided into five cities ( kota) (formerly municipality ( kotamadya)) each headed by a mayor and one regency (kabupaten) headed by a regent. Thousand Islands (Kepulauan Seribu), formerly a subdistrict of North Jakarta. As the economic and political capital of Indonesia, Jakarta attracts many foreign as well as domestic immigrants. As a result, Jakarta has a decidedly cosmopolitan flavor and a diverse culture. Many of the immigrants are from the other parts of Java, bringing along a mixture of dialects of the Javanese and Sundanese languages, as well as their traditional foods and customs. The Betawi (Orang Betawi, or "people of Batavia") is a term used to describe the descendants of the people living around Batavia from around the 18th century. The Betawi people are mostly descended from various Southeast Asian ethnic groups brought or attracted to Batavia to meet labour needs, and include people from various parts of Indonesia. The language and culture of these immigrants are distinct from those of the Sundanese or Javanese. There has also been a Chinese community in Jakarta for centuries. Officially they make up 6% of the Jakarta population, though this number may be under reported. Jakarta has several performance centers, such as the Senayan centre. Traditional music is often found at high-class hotels, including wayang and gamelan performances. As the largest Indonesian city, Jakarta has lured much regional talent to relocate in hope of finding a greater audience and more opportunities for success. The concentration of wealth and political influence in the city means that it has much more noticeable foreign influence on its landscape and culture, an effect illustrated by the presence in the city of many major international fast-food chains, for example. There are railways throughout Jakarta; however, they are inadequate in providing transportation for the citizens of Jakarta. In peak hours, the number of passengers simply overloads the capacity provided. The railroad tracks connect Jakarta to its neighboring cities: Depok and Bogor to the south, Tangerang and Serpong to the west, and Bekasi, Karawang, and Cikampek to the east. The major rail stations are Gambir, Jatinegara, Manggarai, Tanah Abang and Jakarta Kota. The busway takes less than half an hour to traverse a route which would normally take more than an hour during peak hours. Construction of the 2nd and 3rd corridor routes of the busway was completed in 2006, serving the route from Pulogadung to Kalideres. The busway serving the route from Blok M to Kota has been operational since January 2004. Despite the presence of many large, wide roads Jakarta suffers from congestion due to heavy traffic, especially in the central business district. To reduce traffic jams, some major roads in Jakarta have a 'three in one' rule during rush hours, first introduced in 1992, prohibiting passengers on certain roads. In 2005, this rule covered the Gatot Subroto Road. Jakarta's roads are notorious for the behaviour of the traffic; the rules of the road are broken with impunity as bribery is commonplace. Furthermore, in recent years the number of motorcycles on the streets has being growing almost exponentially, ensuring many a problem due to ill-disciplined motorcyclists. Jakarta's transportation also depends on Priok. The outer ring road is now being constructed and is partly operational from Cilincing- Cakung- Pasar Rebo- Pondok Pinang- Daan Mogot- Cengkareng. A toll road connects Jakarta to Soekarno-Hatta International Airport in the north of Jakarta. Also connected via toll road is the port of Merak and Tangerang to the west and Bekasi, Cibitung and Karawang, Purwakarta and eventually to Bandung to the east. Two lines of the Jakarta Monorail are under construction: the green line serving Semanggi-Casablanca- Kuningan- Semanggi and the blue line serving Kampung Melayu-Casablanca- Tanah Abang- Roxy. In addition, there are plans for a two-line subway (MRT) system, with a north-south line between Kota and Fatmawati, with connections to both monorail lines; and an east-west line, which will connect with the north-south line at the Sawah Besar station. The government is also considering waterbus ferries as a cheaper means of transportation along the canals in Jakarta. The primary airport for Jakarta is Soekarno-Hatta International Airport, one of Indonesia's two major international air gateways. Other airport is Halim Perdana Kusuma. Cycle rickshaws, called becak, provide local transportation on the back streets of some parts of the city. From the early 1940s to 1991 they were a common form of local transportation in the city. In 1966, an estimated 160,000 rickshaws were operating in the city; as much as fifteen percent of Jakarta's total workforce were engaged in rickshaw driving. In 1971, rickshaws were banned from major roads, and shortly thereafter the government attempted a total ban, which substantially reduced their numbers but did not eliminate the rickshaws. An especially aggressive campaign to eliminate them finally succeeded in 1990 and 1991, but during the economic crisis of 1998, some returned amid less effective government attempts to control them. Jakarta is the home of many universities, the oldest of which is the University of Indonesia (UI), much of which has now relocated to Depok. Jakarta International School, Australian International School, The Gandhi Memorial International School and British International School are some of the international schools that provide education from primary school up to high school levels for Jakarta's small international community. As the largest city and the capital, Jakarta houses a large number of students from various parts of Indonesia, many of whom reside in dormitories or in a home-stay residence. Similarly to other large cities in developing Asian countries, there is a large number of professional schools teaching everything such as Mandarin and computer skills. 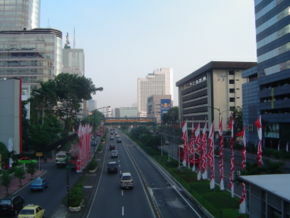 The centre of Jakarta, Central Jakarta, offers some of the more convenient places for tourists to stay whilst visiting Jakarta. With an abundance of hotels in the area to suit all budgets, it also has a wide selection of restaurants, bars and brothels and shopping malls. Public transport is reasonably well-catered for with the main Gambir railway station and north to south busway running along Thamrin Road, for journeys not covered by the busway taxis are cheap and plentiful. The area is also home to Jalan Jaksa, the main backpacker street in Jakarta. Jakarta has more shopping venues than other cities of Indonesia. The biggest mall is located in North Jakarta in the centre of the financial district. While these malls are relatively expensive to be accessible to many Jakartans, they dominate the high-end retail industry. Recent development of satellite cities in the surrounding areas, usually built around their own mega malls, parks, entertainment centers, and in some instances hospitals, has significantly expanded what is considered to be the practical border of Jakarta. Some popular shopping malls includes Pondok Indah Mall, Mall Taman Anggrek, Plaza Indonesia, Mal Kelapa Gading, Megamall Pluit, Mangga Dua Square, Kelapa Gading Square, Plaza Senayan, Mal Artha Gading, Entertainment X'nter, Citos and Senayan City. Jakarta is home of several football clubs. The most popular of them is Persija, which regularly plays its matches in the Lebak Bulus Stadium. The biggest stadium in Jakarta is the Bung Karno Stadium. With a capacity of more than 100,000 seats, it is one of the biggest stadiums in the world. For basketball, the Kelapa Gading Sport Mall in Kelapa Gading, North Jakarta, with a capacity of 7,000 seats, is the home arena of the national basketball team of Indonesia. Many international basketball matches are played in this stadium. The Senayan sports complex is comprised of several sport venues, which include Bung Karno soccer stadium, Madya Stadium, Istora Senayan, a shooting range, a tennis court and a golf driving range. The Senayan complex was built in 1959 to accommodate the Asian Games in 1962. Like many big cities in developing countries, Jakarta suffers from major urbanization problems. The population has risen sharply from 1.2 million in 1960 to 5.8 million in 2000, counting only its legal residents. The rapid population growth has outgrown the government's ability to provide basic needs for its residents. As the third biggest economy in Indonesia, Jakarta has attracted a large number of visitors. The population during weekends is almost double that of weekdays, due to the influx of residents residing in other areas of Jabotabek. Because of government's inability to provide adequate transportation for its large population, Jakarta also suffers from severe traffic jams that occur almost every day. Air pollution and garbage management is also a severe problem. During the wet season, Jakarta suffers from flooding due to clogged sewage pipes and waterways. Rainforest depletion due to rapid urbanization on the highland areas south of Jakarta near Bogor and Depok has also contributed to the floods.